Consumer confidence has fallen to a five-month low in the United States. This reflects general pessimism about the outlook for the economy. What is consumer confidence? Based on a random survey of consumers conducted by an independent organization, the goal is to measure what people think of their immediate economic prospects. It's an imprecise measure, but still useful in assessing the overall health of an economy. The slide in confidence raises the risk that the slowdown in hiring revealed by last month’s jobs report will cause households to retrench, restraining the spending that accounts for about 70 percent of the economy. The weak labor market is overshadowing the benefit of the lowest gasoline prices in five months, one reason why companies like Ford Motor Co. (F) (F) are keeping an eye on attitudes. Canadians are most gloomy about near-term job prospects and the health of their finances, according to the Conference Board's latest consumer confidence survey, released Tuesday. The consumer confidence reading for the month shows a fall of 6.8 points to 74, about where it stood in January. It was much the same story south of the border where the Conference Board's U.S. index dropped for the fourth month in a row to 62 points, also the lowest level since the start of the year. Economists often don't put a lot of stock in consumer confidence surveys, but Jennifer Lee, a senior economist with the Bank of Montreal, said there is reason to take these results to heart. Canadians and Americans have been bombarded with daily reminders of the intractable nature of the European crisis and reports that businesses are holding back on investment and hiring, Lee said. In this backdrop, it is natural to assume households may also be reluctant to go out on a limb on purchasing decisions, which would further hurt the economy. Maybe it's the evil confidence fairy at work again. But even putting aside that straw-person argument, the recent path of consumer confidence suggests some interesting updates to reigning economic models. In simple Keynesian models of consumer behavior, the marginal propensity to consume (MPC) is assumed to be fixed - e.g. for every dollar I earn, $0.75 will be spent and $0.25 will be saved - or at the very least to be independent of other important macro-variables. It's this assumption which implies the so-called "multiplier" to government spending. What if MPC is a function of other variables, such as consumer confidence or government spending? In other words, what if consumers spend less as government spends more, as predicted by the Barro-Ricardo equivalence theorem? Theory: propensity to consume declines with government spending. This throws a wrench in simple Keynesian economic models, and also helps to explain why we've had such a lackluster economic recovery, in spite of massive increases in federal spending over the last four years. 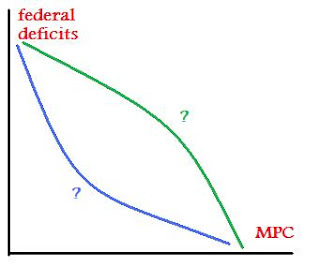 We could argue about the exact shape of the "MPC curve" (it could be either the blue, or the green line, or something else entirely) and the exact impact it will have on economic output. But it's pretty much undeniable that the fixed-MPC version of Keynesian models should be placed in the dustbin of history. "In simple Keynesian models of consumer behavior, the marginal propensity to consume (MPC) is assumed to be fixed - e.g. for every dollar I earn, $0.75 will be spent and $0.25 will be saved - or at the very least to be independent of other important macro-variables. It's this assumption which implies the so-called "multiplier" to government spending." Where does this "fixed" MPC theory come from? As far as I know, Keynesianism is clear that income matters a great deal in consumers' MPC. Indeed, Krugman argued that not two weeks ago: when debtors began saving, creditors didn't increase their spending to compensate, causing reduced net spending. ("Deleveraging and the Depression Gang"). Thus if government either forces creditors to increase their MPC or increases its own MPC, net spending grows. "[Ricardian Equivalence] throws a wrench in simple Keynesian economic models, and also helps to explain why we've had such a lackluster economic recovery, in spite of massive increases in federal spending over the last four years." RE isn't explanatory. One, you've left "massive increases in federal spending" undefined. If we look at straight federal spending, then why wasn't RE a problem in the 1980s or in the 2000s? (http://research.stlouisfed.org/fred2/graph/?g=8kK) Do you include automatic stabilizers like Unemployment and Social Security payments due to unemployed people not paying income taxes in your definition of federal spending? How does your hypothesis account for the fact that federal spending is currently dropping even in current dollars? Second, RE is far too idealized to be useful. For example, it assumes that those who receive a tax cut will save their added income under the belief that their taxes will be raised in the future and bequeath all their assets to their children when they die and that their children will continue saving. In the real world, I'm not seeing much momentum to return the highest income tax brackets to their pre-Reagan levels, much less their pre-Kennedy ones. In fact, I see the opposite: an attempt to shift taxes onto the poor via national sales tax or VAT. Theories need to explain why things happen one way and not another. RE doesn't do this because there have been plenty of times in the past when federal spending grew but didn't cause a shift to consumer saving that wiped out any increase in net spending. Also, asserting, "Federal spending is high" without defining "high" means RE is an accommodation, not an explanation, and accommodations aren't falsifiable. In order for RE to work you will have to sacrifice parsimony for explanatory power, and that leaves aside the fact that federal spending is dropping, which should mean the theory doesn't apply. The simple Keynesian models I describe here have no micro-theory behind them whatsoever. That's why we should be skeptical of them. I doubt even Krugman would defend MPC as good theory and that's fine - this argument isn't necessarily directed at him. RE as I'm using it here just means that consumers factor future taxes into current consumption decisions, which is a mild extension of standard micro consumer theory. Falsifying it would entail attacking the permanent income hypothesis or saying people are myopic about the future, which opens up a much bigger debate. Falsifying this theory requires more than just observing conditions which contradict it. The reason that Keynesian models should be held to a higher standard is that their micro-foundations are much weaker. Why didn't RE happen in the past? Consumers felt richer in the 80s' and 2000s because their home prices were rising. The housing market was making them richer faster than the federal government was making them poorer, but now that situation has reversed. It's simply false to say federal spending is dropping. It hit a record high in 2009, dropped a small amount, and is set to keep going up in the future. And, I bet if you took a straw poll of people on the street, and asked them whether they thought government spending was "high", and whether it was rising at an unsustainable level compared to the economy, and whether they expected taxes to go up, the answer to all questions would be yes.